With the upcoming Resident Evil 2 remake’s release date approaching closer and closer, Capcom has been revealing a little more to us each week. Character skins are something that came around in the Resident Evil series during the fourth incarnation in the series. They reappeared in the fifth game, but by the time the sixth game came out, the alternate skins were only used for online play and the mercenaries mini-games. The seventh game doesn’t seem to have alternate outfits either, due to the first-person play style. However, Capcom brought the feature back, adding in some new costumes for Leon and Claire in the remake. This started a three days ago on twitter, revealing Claire Redfield’s new alternate costume: “Military”. This was the first outfit to be revealed on October 18, showing off Claire with a do-rag, a bullet proof vest, and all the bells and whistles you’d need for being out in the field. It shows off a little bit of one of the maps in the game as well, and a little more of Claire’s wonderful face. The next one to be revealed was on October 19, and this one was for Leon: “Arklay Sheriff”. This one shows off the front of the Raccoon City Police Department’s precinct, as well as Leon in a classic sheriff uniform, including the big, gaudy hat. But it is a little fun to know that it’s making a call back to the Arklay Mountains, the setting of the first game inside the Spencer Mansion. All he’s missing is a horse, and he would be a mounty. The third outfit to be revealed, along with a classic filter, was another one for Claire: “Noir”. Not only does this show off the classic 1930/1940’s style of the classic film noir, Claire shows off this classic look with the half-tucked in white collar shirt, the suspenders, and another gaudy hat. Still a fun outfit for her. But this also reveals the classic black-and-white look of the Noir filter for the game as well. So far, those are the three new outfits revealed. It’s unsure of how many Capcom has made, and how many they’ll reveal. 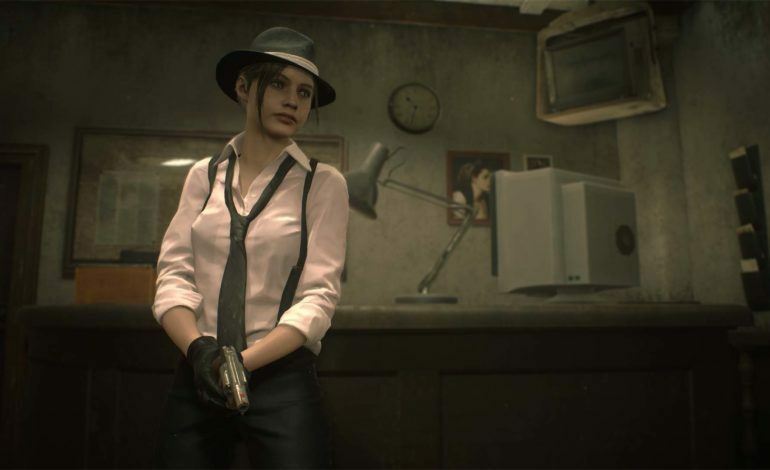 Capcom has stated, and shown, in all the tweets for each alternate outfit reveal that they will be available in the Deluxe and Collector’s edition of Resident Evil 2, coming out January 25, 2019.